Home Births Grow More Popular In U.S. : Shots - Health News Advocates of home births applaud the trend, but some doctors caution there are risks when deliveries come with complications. The federal data suggest the trend appears to be driven primarily by the choices of older, white women. Home Births Grow More Popular In U.S.
Shannon Earle holds her new baby Kiera Breen Earle, moments after she was born at their home last year. The number of women delivering babies at home in the United States has increased significantly, according to the latest government data released Thursday. Home births increased by 29 percent between 2004 and 2009. The upward trend is being welcomed by some advocates of home births and midwives, but it's also raising concern among some doctors. Still, births at home remain pretty uncommon. Only 0.72 percent of births in 2009, or 29,650, were at home, up from 0.56 percent in 2004, according to the National Center for Health Statistics. When Kate Miller was getting ready to deliver her daughter last spring, the 38-year-old yoga instructor had no doubts that she wanted to do it at home. "I wanted the comfort and quiet of my own home and I didn't want any unnecessary procedures done to me or to her," Miller says. Miller arranged for two midwives to come to her apartment in Washington, D.C., to help last year. She's not alone. The government analysis shows that the increase in home births came after a 14-year decline between 1990 and 2004. "There's been a statistically significant increase in home births," says T.J. Mathews, a demographer at the National Center for Health Statistics. "This is a larger change in a shorter time period, so it is something to notice." The increase in home births isn't occurring among all women. The trend appears to be being driven primarily by older white women, according to the report. 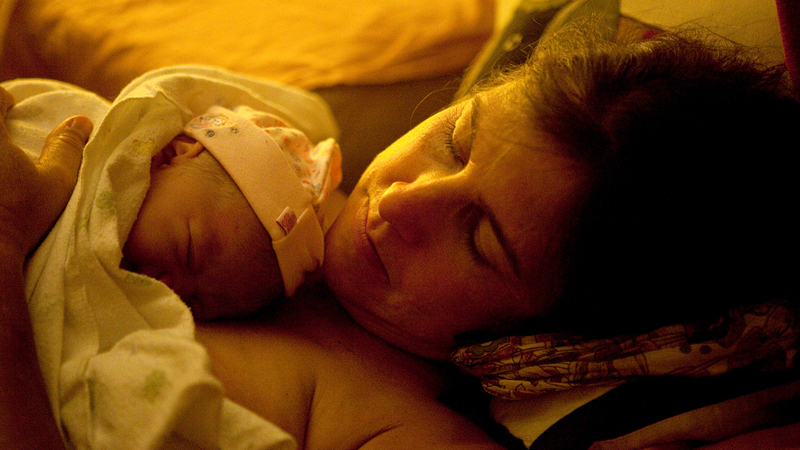 Home births increased 36 percent among white women between 2004 and 2009, the report found. The report didn't examine the reasons for the increase. But some experts said that it may be partly a reaction to the sharp increase in caesarean section deliveries in recent years. Some women may hope to avoid a C-section, and other medical procedures that often occur in hospital deliveries. "It may be they're more comfortable challenging the system," says Eugene Declercq of Boston University, who helped conduct the analysis. Women who are married and have already had a child are also more likely to have a home birth, the report found. "It may be that older mothers who have had the experience of having had a hospital birth may want to have the experience of having a home birth because of whatever they experienced in that first birth," he says. Whatever the reason, the trend is being welcomed by those who think home births are a better choice. "It's as safe for women who are at low risk as hospital birth for low-risk women but with significantly reduced rates of preterm birth, low birth weight, unnecessary caesarean sections and also very high rates of maternal satisfaction," says Katherine Prown of The Big Push, which is advocating for legalizing midwives in more states. Babies born at home were less likely to be born prematurely or underweight, the analysis found. And for many women with uncomplicated pregnancies, home birth can often be a fine alternative, experts say. The two big concerns are making sure the midwife delivering the baby at home is qualified to spot a problem quickly and can get help in time. If an at-home delivery runs into trouble and there's a hospital five minutes away, "that probably is not going to be a big problem," says Dr. George A. Macones of the American College of Obstetricians and Gynecologists. But if you're half an hour away or 40 minutes away, then that really could be a big problem." Miller, the Washington yoga instructor, went through more than a day of intense labor. At one point, her midwife realized her baby's head was tilted in a slightly dangerous position. "At one point because of this she had me going up and down our staircase so I could rock my pelvis and get my daughter's head to come down evenly. And she did, and I was able to you know deliver her naturally," she says. But she has no regrets. Quite the opposite. She's grateful. "I was able to have my daughter at home. I was able to have a peaceful and supported natural childbirth experience. She was born in our nice, cozy bedroom," she says.